As of this weekend, we can wave goodbye to these warm temperatures (insert sad face here). In light of that, I thought I would give you some options for apres-yoga cover ups. I love to have a great cover up or sweatshirt in my yoga bag, it’s a great transition piece to go from class to any lunch, brunch or grocery store trip. Here are a few of my new faves for fall! 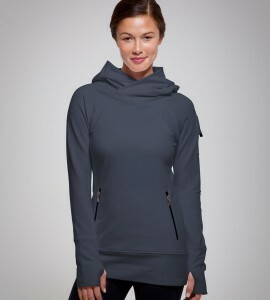 The Zobha Cozy Hoodie is a great casual piece. Long enough to give bottom coverage, but structured enough to still look put together. The Heather Fashion Slouchy top is an on trend cover up! Love the oversized top with the tight waistband which gives plenty of shape. The dolman sleeve gives us a throwback feel. The Single Button Jacket from Zobha looks like a peacoat but feels like a sweatshirt. Talk about comfy chic! The Spanx Active Collection is now available in a few retailers, Atlanta Activewear being one of them. This little wrap and go skirt is great! Throw it on over any leggings you already own, or grab a pair of Spanx leggings for an instant tummy tuck! The MPG Sport Trek jacket is a fitted fleece that is contoured to your shape, unlike those other fleeces like Northface or Patagonia. Keep your shape and keep warm this winter! Want more tips on how to wear your activewear? Check out my website YogainHeels.com or follow me on facebook (Yoga in Heels) and Twitter (@YogainHeels)! Stay warm and see you on the mat!